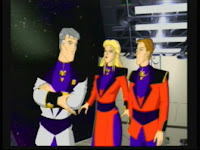 Solar Crusade is an on-rails FMV shoot 'em up designed and published by Infogrames Multimedia created using Softimage 3D and modelled on Silicon Graphics workstations hardware for the Windows 95 operating system and Philips CD-i video game console. It is the follow-up sequel to Chaos Control. Something I've never seen anyone mentioning is that the amount of graphical detail in Solar Crusade is very high. While flying through the desert, have a look at all the details, the fog whirling and the textures all around. I think I've never seen a CD-i game offering these kind of graphics. 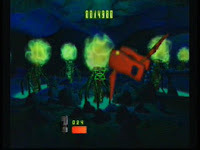 Considering its announcement in 1996, it took Infogrames three years to produce Solar Crusade. Eventually it wouldn't have made it to CD-i: the system was all but dead but Infogrames still published the CD-i version in 1999. But why did they have to misprint the CD-i logo in the left corner!! Let's have a look at what CD-i Collective had to say about this game: "The war is over. The Kesh-Rahn forces are obiterated. Earth has been freed from the alien menace. All is well within the earth defense fleet... or is it? Picking up a short time after the end of CHAOS CONTROL, Lt. Jessica Darkhield and company discover a derlict freighter while exploring the battlefield near Mars. Upon closer inspection they discover something they wish they never had... the Kesh-Rahn LIVE!!! Whoa! 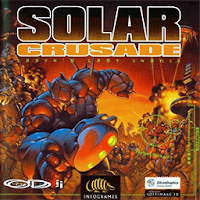 Coming out of left field, INFOGRAMES released SOLAR CRUSADE long after the commercial death of CD-i. The sequel to the brief, but stunning looking CD-i classic Chaos Control, Solar Crusade shows that even a track-shooter deserves a decent sequel. Are we of the Collective happy to see it? Two words... OH YEAH! We were expecting a very poor showing from a title released this late in it's life (something like Laser Lords or Rise of the Robots). Happily, Infogrammes served up a decent swan song for their CD-i development. Visually, it's dead on from the previous game, with only a few noted exceptions. Primarily... It's DARK. Really dark. From level 1 and up, it just seemed everything video wise was encoded a bit on the dark side. Not too offensive, but it wouldn't have hurt them to kick the brightness up just a bit. Sadly, the weapon effects are still the same. Single lines with Atari-esqe sound effects to acompany it. All else we can knock on this game is the anime. While definitly a step up from the rigid characters of the original, now they seem to be a bit too... bizzare in some of their movements. They needed to find a middle ground, still, its an improvement. The addition of different weapons, and ammo levels was nice, making it so you couldn't just blast away only worrying about your gun heat. But, visually there is no difference between the weapons. Others do slightly more dammage to bigger bosses, but you'd never really notice you changed, unless you count the fact that each new weapon makes its own (anoying) sound. Personally, I'd have been happy even if they'd just made the lines come from a different area on the screen. heh. As in the original, sound is so bizzarely varied. For the video, nothing but the best of sounds. Enemies engines scream by. Sounds of your ship coming almost too close to the hills echo in your speakers. For the combat of both you and the enemy, effects that would make the old Apple II cringe. Lip-sync for the anime characters is quite shoddy, making some of it like watching the old dubbed japanese monster movies. However, they did allow the voice actors to portray SOME emotion. Adding a small spark of life to the otherwise flacid and very one-dimensional characters. Control with the mouse is dead on, with very little to complain about. Using the 3 or 4 button pads is ok, but the cursor does move a bit too slow to keep the enemies from getting in some cheap hits. One nice thing added though is branching paths. You must do something to open up other areas of the level, or you'll just keep looping in the same level until you figure out what it is. To sum it up, a nice improvement over the origial game. Still flawed, but definitly the challenge was raised. Would make a nice addition to any CD-i players library. Think of it as a less interactive version of THE LOST RIDE only without all the programming bugs TLR has." What do you think is the best fmv shooter Bas?